The Billionty-Oneth Geek: Bad Lieutenant: Port of Call New Orleans!!! Bad Lieutenant: Port of Call New Orleans!!! Nicolas Cage is one bad assed mother fucker! This is the Cage we know and love. Where has he been all these years? Let's list all his movies since Adaptation because the list is amusing: Matchstick Men, National Treasure, Lord of War, The Weather Man, Any Bully, World Trade Center, The Wicker Man, Ghost Rider, Next, National Treasure 2, Bangkok Dangerous, Knowing and G-Force. So 2 or maybe 3 'okay' ones amidst the sea of crapfests. Honestly, he's probably one of the best actors working today, yet he subscribes himself to schlock after schlock. But I know Cage is a geek inside and he must be doing those movies to satisfy that inner geek within (note: he named his son Kal-El ie. Superman's real name... I bow down to his geekery, I am humbled). This holiday season, I haven't really been pumped for too many movies at all, but I was pretty excited to see 3 particular movies which includes Up in the Air, Avatar and this one, Bad Lieutenant: Port of Call New Orleans. I was excited when I heard Herzog was first involved with the movie, but at the same time felt a bit wary of Cage's involvement. I love Werner Herzog. He is such a peculiar man, but a very dark humoured, articulate man at the same time. I love how he bounces between doing visceral fictional movies and more nature related documentaries. I remember seeing him on Late Night with Conan O'Brien last year, promoting his documentary Encounters at the End of the World and I was balling at his strange sense of humour (I can't find the clip, but he talks about getting shot at, and also having to eat a shoe because he lost a bet). Port of Call New Orleans is not exactly a remake, but more of a movie that pays homage to the original Bad Lieutenant (1992) by Abel Ferrera. At the core of this movie, we follow Cage's character as he tries to hunt down a drug lord responsible for a homicide in New Orleans. But what breathes life into this movie are all the scenes and mini-storylines that depart from the central story. 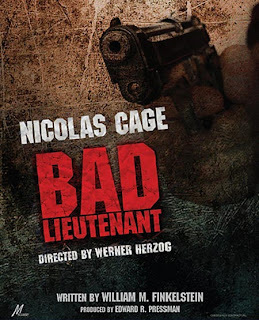 We see Cage and we learn that he is in fact a bad lieutenant. He's constantly snorting up narcotics that he steals from the evidence room, he takes bribes and sexual favours instead of arresting, he blackmails people, he pimps out his prostitute girlfriend, amongst other things. So a colourful lifestyle altogether! There's a scene near the end of the movie that I can't come to grips with. It's this surreal scene that seems very sugary coated and happy, and I can't tell if it's for real or if everything during and after this scene is just a hallucination from the drugs. Anyhow, it had me laughing out loud because of the absurdity, but maybe that's the whole point, it is more dark humour in a way. We see so much badness and evil then this euphoric scene springs up. If you've seen the movie, I'd like to know what you think. Overall, the movie was pretty darned good, but it didn't blow me away. If this movie ends up on my top 10 list of the year, it's because of Cage only. Nicolas Cage just flat-out ruled this show. Sometimes it's easy to forget that behind that receding hairline is a brilliant actor. His performance in this movie is maniacal and it gets better as his character descends further into madness and drug dependence. Aside from his performance, all the supporting actors also do a great job, surprisingly, that includes Eva Mendes as Cage's prostitute girlfriend. But almost as much as I adored Cage, I also loved the smaller parts by Xzibit and another geek favourite, Brad Dourif (!!!!). All great across the board. That about does it for today. Iguanas. Later geeks!